The timeless, humanistic architecture of Jože Plečnik is part of the Tentative list of Slovenia in order to qualify for inclusion in the World Heritage List. The work of Jože Plečnik emanates a special spirit for me, though I am not able to exactly explain what it is and why it is so. I know his work already from Prague as he was the major architect of the first president of Czechoslovakia in 20s-30s of 20th century and reshaped the Prague Castle. Therefore, some of his projects and buildings are parts of WHS Prague. His church built for Prague neighborhood Vinohrady was originally the component of this nomination with Ljubljana, but it has changed after bilateral negotiations and advice of ICOMOS. Now, only several buildings, bridges, squares and one church in Ljubljana are proposed. 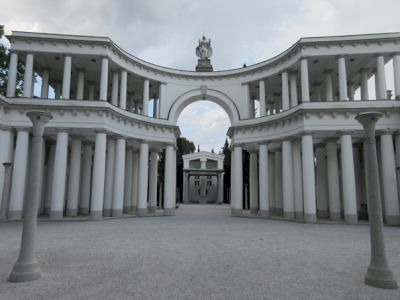 Plečnik was active from the break of 19/20th century as a pupil of Otto Wagner in Wiena. After WWI, his work (as well as his personality) radically changed. Thus, his style was no more Art Nouveau, but turned into a weird variation of neoclassicism and autochthonic modernism, and he was active till 50s of 20th century. Plečnik did not like functionalism and architecture with the function at all, which was no architecture in his opinion. He was influenced by theories of architects like Semper (Dresden opera) and Palladio (Vicenza). According him, real architecture should be timeless, beyond function, and it should consist of symbols recognizable for common people - therefore we can find the symbols of ancient Rome, Egypt and Etruscan era in his work (pyramids and columns everywhere). Plečnik was very, almost extremely, spiritual, ascetic and of humanistic nature. He was active in ultraconservative, right-oriented and a bit nationalistic parties in Wien and Slovenia. He believed that Slovenian nation is not of Slavonic but of Etruscan origin. It was quite significant point that can be recognized in his architecture. Nowadays Ljubljana is located in the place of former Roman town Emonia. The reconstruction plan of Ljubljana designed by Plečnik was very complex and run in line with this ancient testimony. Therefore, his style is sometimes called as neoclassicism, but it does not fit. He had also very special attitude towards older buildings and structures: He did not destroy them but recycled, incorporated into new buildings or at least transfer them to other places. I spent in Ljubljana one week in September 2018, and the impact of Plečnik is visible almost on every corner of the very small city center. From the proposed components, I could enjoy walking along embankments of river Ljubljanica with several bridges and colonnades, and adjacent squares. One can see big difference between central parts designed by Plečnik and quite ordinary streets (further from the cathedral and the river) of historical center. The jump forwards due to the Plečnik is clearly evident. I also visited the National and University Library (considered as his best work in Ljubljana) with typical brick/stone facade with recycled ancient stone pieces from excavations and parts of original baroque palace and with the colonnade-like staircase inside that remind me his work in Prague castle, and also the Žale cemetery in the outskirts of Ljubljana (maybe the most "strange" structure from the series) with monumental entrance (PHOTO) and ensemble of small chapels built in diverse architectonic styles. It is a pity, I could not see the church of S Michael in Ljubljana suburb. Instead I visited S Francesco (not included to TWHS) but it was very strong experience for me anyway (contrast of austere exterior and very fine interior of unique disposition). All in all, I can see OUV in his work and it is visible and recognizable directly on site. The Ljubljana components designed by Jože Plečnik should be inscribed regardless what one knows (or thinks) about personality and theories of mister architect. His work is an interesting counterpart to other branches of 20th century architecture such as works of Mies van der Rohe, Adolf Loos, and Le Corbisieur. After the First World War a first version of Yugoslawia was formed consisting of Croatia, Serbia and Slovenia. As a consequence the importance of Ljubljana grew as it became a regional capital. To reflect the growing importance and to create a distinct national identity in their capital they asked Jože Plečnik to remodel the city. Jože Plečnik was a successful architect, having made himself a name in Vienna and Prague. In Vienna he was a figure of the Vienna Secession movement . In Prague he redesigned the Prague Castle. He applied his ideas to the center of Ljubljana. The most notable structure to me were the river banks he constructed. If you have ever been in Ljubljana you will have seen his work. I am not sure that the narrative of the great Jože Plečnik holds. Looking at his wikipedia page I can't shake the feeling that an enthusiastic Slovenian optimized his English page. The German page is far less enthusiastic. Looking only at his CV he seems to be primarily of regional importance. The buildings I saw in Ljubljana are not ground breaking. Indeed they seem to be watered down Art Deco buildings, nice to look at but inconsequential and a bit late to the party. The two most distinctive examples of his style are the Roman city gate with the pyramid on top and the Trnovo Bridge. They are not special or great or even unique. Comparisons to Antonin Gaudi are way off target. And it does feel the Slovenians are trying to leverage the world heritage process to bolster the credentials of a national architect into a global star. And to justify a bit why I say dated, I would point you to Kaunas, a city also redesigned after World War 1. The styles of the two cities could not be more different with Kaunas being ahead of the curve and Ljubljana behind. 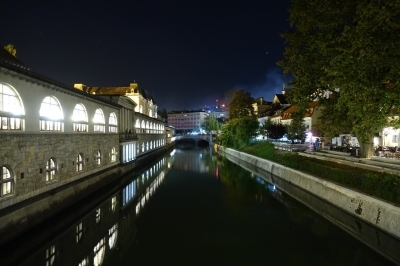 Still, I do think Ljubljana overall deserves its place on the list. There is much here to like and I understand all the tourists flocking to the city. Ljubljana being the capital is well connected to all parts of Slovenia. There are direct busses to Idrija and busses and trains to the Skocjan Caves (Divaca). Google maps seemed complete with regards to the connections, schedules and bus stops. To get out of Slovenia you will find plenty of bus connections. I came from Triest. There are also connections to Zagreb.